We ship the SAME DAY Tuesday through Friday if you order by noon Central Time in the continental US unless otherwise indicated on product information page. Please note that we normally don't ship on Mondays except by special arrangement. If you need to arrange for shipping on a Monday, contact us and we'll be glad to accomodate your request for no extra charge. Currently, shipping is FREE by FedEx Ground within the continental US on orders of over $100. 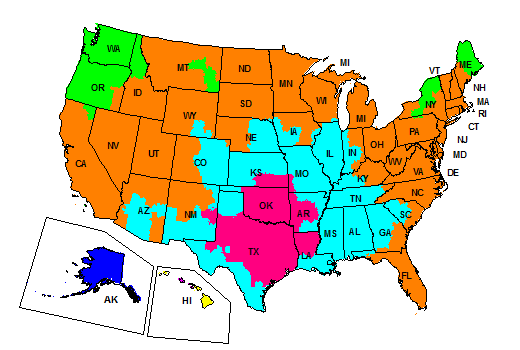 See map below for FedEx GROUND transit times in the US and Canada. Transit times differ for other shipping methods and destinations. ... YES we ship to Canada...AND worldwide! Order processing time for shipments outside the US is normally no more than 2 business days. If shipping options are not presented during checkout for your location, contact us and we will do our best to find a shipping solution.